In-Sync Magazine January 2018 H a p p y N e w Y e a r ! Discover the latest production tools and gear to help you capture high-value content more easily and more economically than ever. From lighting to stabilizers, and from drones to jibs, come to NAB Show ® to connect with the world's most innovative tech, network with production gurus and learn from the creative masters. THIS IS WHERE THE GLOBAL CONTENT ECONOMY THRIVES. 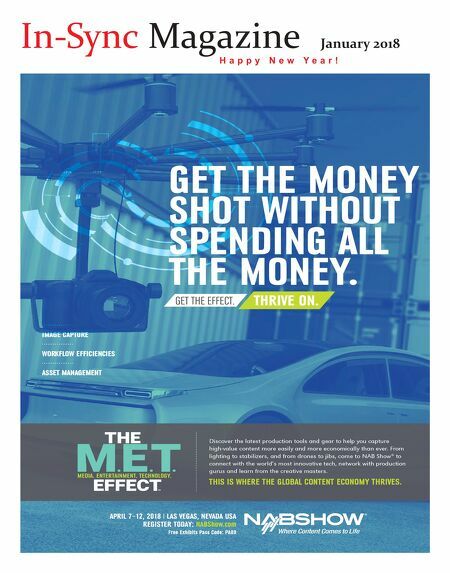 APRIL 7–12, 2018 I LAS VEGAS, NEVADA USA REGISTER TODAY: NABShow.com Free Exhibits Pass Code: PA89 GET THE MONEY SHOT WITHOUT SPENDING ALL THE MONEY. THRIVE ON. GET THE EFFECT.